В 1917 году фирма Блэкборн, специализирующаяся на гидропланах и летающих лодках, испытала свою новую разработку - двухмоторный поплавковый гидросамолет "Тип G.P". Испытания прошли успешно, и руководство фирмы предложило самолет британскому Адмиралтейству в качестве морского бомбардировщика и патрульно-противолодочной машины. Аппарат был в целом одобрен. Воздушный департамент Адмиралтейства оплатил постройку установочной партии в 20 штук, высказав при этом ряд пожеланий. Прежде всего требовалось установить более мощные двигатели, повысить бомбовую нагрузку, а также заменить поплавки на обычное колесное шасси. Доработанный в соответствии с пожеланиями заказчика аэроплан получил прозвище "Кенгуру", которое вскоре превратилось в официальное название. (Любопытно, что сейчас даже в Англии никто не помнит, почему самолету дали такое имя). "Кенгуру" вышел очень удачным. Испытатели отмечали необычную для столь крупной машины легкость управления, послушность и прекрасный обзор, обусловленный вынесенной далеко вперед кабиной. Самолетом заинтересовался Королевский воздушный корпус, заказавший для фронтовых испытаний 4 экземпляра. Блэкборн "Кенгуру" - двухмоторный четырехместный полутораплан смешанной конструкции с полотняной обшивкой, весьма схожий с основным английским бомбардировщиком тех времен "Хэндли-Пэйдж O/400". Но благодаря значительно меньшим размерам и массе при той же примерно мощности двигателей "Кенгуру" обладал более высокими летными данными. Серийные машины начали выходить из заводских цехов в январе 1918-го. В апреле 4 бомбардировщика, заказанные Воздушным корпусом, поступили в 246-й дивизион на восточном побережье Англии. Остальные использовались флотским командованием для патрулирования над Ла-Маншем и Северным морем. В августе один из них, по английским данным, утопил немецкую субмарину. Других военных успехов за "Кенгуру" не числится. Потери составили три самолета, разбившихся по техническим причинам. Осенью 1918-го британское авиационное командование ожидало скорого поступления на фронт новых, более перспективных самолетов. В связи с этим очередных заказов на "Кенгуру" не последовало. По окончании военных действий уцелевшие бомбардировщики фирмы Блэкборн переклассифицировали частично в транспортники, частично - в учебные машины. В этом качестве некоторые из них прослужили до 1929 года. Две турели с пулеметами "Льюис", 420 кг бомб. Одновременно с фирмами "Виккерс Лтд" и "Де Хевилленд Лтд" над тяжелым двухмоторным фронтовым бомбардировщиком работали и инженеры фирмы "Блэкборн Эйрплэйн". Им удалось создать машину во многом превосходящую по летным данным своих конкурентов. Но первый полет она совершила в конце 1917 года, и до конца войны было построено 14 машин, которые в основном применялись в боевых действиях в проливе Ла Манш и в Северном море и наносили удары по морским целям. Конструкция во многом стандартная для большинства машин этого типа. Фюзеляж цельнодеревянной конструкции, прямоугольного сечения, с фанерой и полотяной обшивкой, в носовой и хвостовой части фюзеляжа, как обычно, устанавливались турельные пулеметные установки. Полуторапланная трехстоечная коробка крыльев имела цельнодеревянную конструкцию. Консоли складывались по наружным стойкам двигателей. Верхнее крыло оборудовалось элеронами. Над нижним крылом на выносных стойках устанавливались 12-цилиндровые, жидкостного охлаждения, рядные, V-образные двигатели Роллс-Ройс "Игл IV" мощностью 253 л. с. Оперение бипланного типа также имело цельнодеревянную конструкцию, двухкилевое. Управление тросовое, от штурвала и педалей. Шасси имело 2 тележки, устанавливаемые под крылом под двигателями. На двигателях стояли лобовые сотовые радиаторы и четырехлопастные деревянные винты. Машина имела довольно высокую весовую отдачу, приличную скорость и маневренность. Но после войны оставшиеся машины были сняты с вооружения и эксплуатировались в течение нескольких лет как транспортные и почтовые машины. The landplane version of the G.P. seaplane referred to in the previous section was designated R.T.1 or Reconnaissance-Torpedo type 1 and constructed in the Blackburn Olympia Works under the type name Kangaroo. The Air Board's decision to operate over the sea with land machines instead of marine aircraft was not merely a tribute to the reliability of the Kangaroo's Rolls-Royce engines and to its exceptional range and bomb load when relieved of the heavy float undercarriage, but to a realization that the ability of patrols to take-off must no longer be dependent on sea conditions. 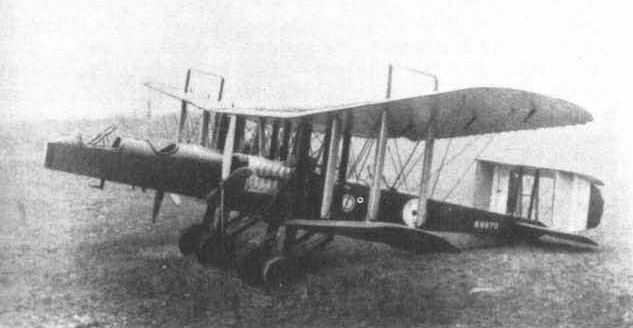 The fabric-covered, wooden airframe of the G.P. was retained, complete with the wing-folding mechanism, but all the main metal fittings were machined from forgings instead of being built up from sheet metal, and the top decking of the fuselage was almost entirely deleted, further emphasizing its already exceptionally slim lines. A number of other structural changes were made, including raising the engine nacelles into the mid-gap position by means of complicated strutting; replacing the side-mounted radiators by the frontal honeycomb type; increasing the rudder area by means of a rounded extension of the trailing edge; and fitting rectangular instead of triangular pylons to brace the massive 11-ft upper mainplane overhang. The four-wheeled land undercarriage was in two separate units, one under each engine nacelle, and consisted of two simple V struts with cross axle. These were quite rigid and devoid of shock absorbers, the only springing being the give in the 900 x 200 mm pneumatic tyres. The divided undercarriage made the Kangaroo ideal for torpedo-carrying but despite the original intention and designation it was not used in this role, offensive armament consisting of four 230-lb bombs, or a single 520-lb bomb, suspended tail-down in a special internal compartment between the main spars of the lower mainplane. Four smaller bombs were carried externally on racks bolted to the bottom longerons of the fuselage, all under the control of the front gunner whose cockpit was equipped with an RNAS Mk IIA low-altitude bomb sight. Defensive armament comprised two Lewis guns on Scarff rings, one in the nose and one aft of the wing, so that the normal crew was finalized at three - the front gunner observer bomb-aimer; the pilot, sitting 8 ft back from the nose; and the rear gunner wireless operator. Night-flying and W/T equipment were fitted as standard, and dual purpose ailerons, rigged with a droop of 3/4 in for normal use, could be lowered to act as landing flaps and were operated by a large wheel mounted on the control column. For reasons which defy deduction, the rear gunner's cockpit was provided with rudder and engine controls but had no control column or ignition switches. An early intention to raise the tail by means of a long, pylon-mounted tail skid giving adequate ground clearance for a prone gun position under the fuselage was not proceeded with, and all Kangaroos had short tail skids of welded steel. Two 250 hp twelve-cylinder vee-type water-cooled Rolls-Royce Falcon II engines driving four-bladed wooden airscrews gave the machine a maximum speed of 98 mph at ground level, and the total fuel capacity of 215.5 gallons (97.5 in the front tank and 118 in the rear) gave an operational endurance of eight hours. Each nacelle carried its own 8-gallon oil tank and an M.L. exciter which made engine starting so easy that a Kangaroo could be airborne in under 20 min. Clifford B. Prodger, an experienced American freelance test pilot, at that time under contract to Handley Page Ltd to test their big H.P. 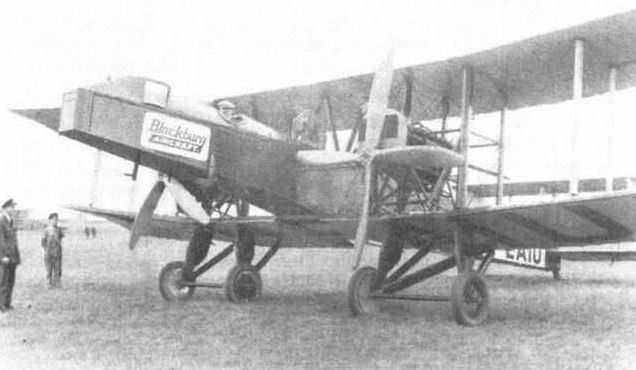 O 400 bombers, was engaged by the Blackburn company to flight test the prototype Kangaroo, B9970, and on 3 January 1918 it was delivered to the Aeroplane Experimental Station, Martlesham Heath, where it was put through official trials which lasted some three weeks. Martlesham's evaluation included comparative trials between the Kangaroo and the Avro 529 one-off, long-range bomber prototype 3694. These were staged on 19 January. It is difficult to see what conclusions could be drawn from such a comparison since the Avro 529, powered by two early 190 hp Rolls-Royce Falcon engines, was smaller and in a lower weight class. Later that day the undercarriage of the Kangaroo collapsed with the tests only partly completed, and as a result the device for lowering both ailerons to act as landing flaps was never tried. After the necessary repairs, all the remaining performance testing was completed by 26 January, and by 2 February the makers had been advised that the aircraft was ready for collection. A Blackburn working party began to dismantle and pack it on 9 March and it left for Brough by rail on 27 April. The resulting Martlesham Report M.169 stated that the machine was pleasantly light on the controls at cruising speed but became markedly nose heavy in an engine-off glide, with excessive loads on the control column. 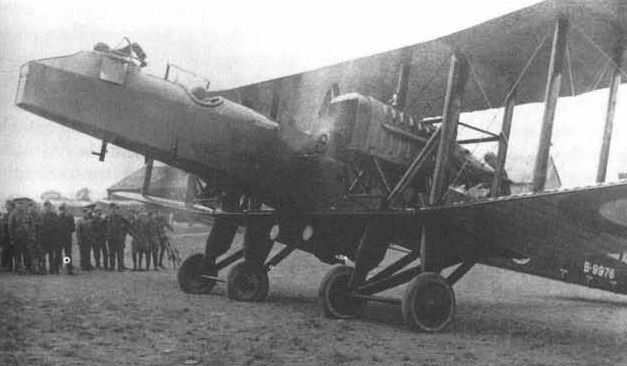 Lateral control was very light but undergeared, and the twin rudders were difficult to operate because foot trolleys had been fitted in place of a rudder bar and the control wires passed through the rear cockpit where they were liable to be trodden on. Lack of torsional rigidity caused the rear fuselage to twist when the aircraft came out of a steep turn; the front gun was so far in front of the C.G. that it was off balance; lack of fuselage depth made it impossible for the gunner to get down low enough to work it, and his seat was extremely uncomfortable; and the aft gunner was prevented from firing in a backward direction by the biplane tail unit. A requirement for up to 50 Kangaroos had been foreseen, but in the light of the defects enumerated by Martlesham and in response to a departmental enquiry, Lt Col J. G. Weir, Chief of the Technical Department, stated in a memorandum dated 4 February 1918 that ...'The 20 Kangaroos which are already well in hand at Blackburns will be similar to the machine in the attached report. 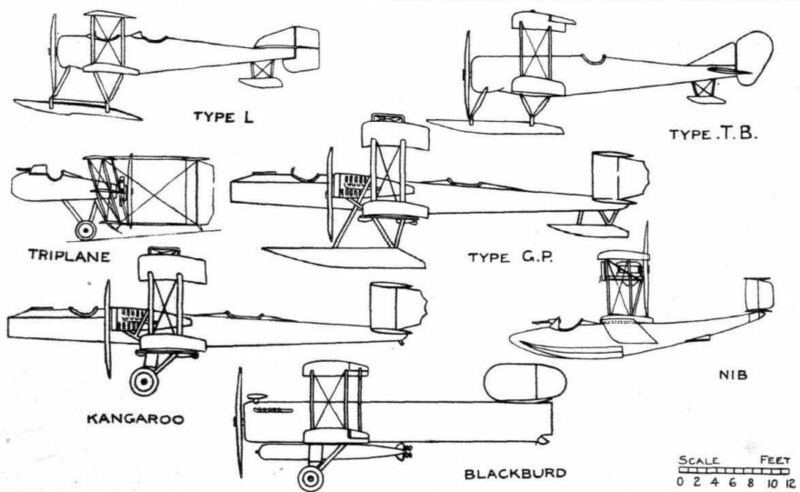 It is understood that no more are to be ordered and no steps have been taken to modify the machine...' Despite this statement the 19 subsequent aircraft, all of which were test flown by Blackburn's chief test pilot R. W. Kenworthy, must have had strengthened rear fuselages and other modifications because no further twisting or other difficulties were ever experienced. The scheme for using the ailerons as flaps was abandoned and the aircraft were fitted with sprung undercarriages, each front leg incorporating rubber shock absorbers in a streamlined wooden fairing. At the same time, the front fuselage was built up to improve the lot of the front gunner, and his mounting was raised 9 in to give freedom of fire in all forward directions. B9970 was also modified to this standard and retained its 250 hp Rolls-Royce Falcon lis. This mark of engine also powered the next four Kangaroos, but the remaining 15 aircraft had 270 hp Rolls-Royce Falcon IIIs. The 20 Kangaroos, intended originally as G.P. seaplanes for the Admiralty, were at first allotted serial numbers N1720-N1739 in a series reserved almost entirely for marine aircraft but, following the usual practice in those days, they were renumbered on transfer to the RFC and completed as landplanes for anti-submarine work as B9970-B9989, but Blackburn's production rate was slowed by a shortage of cypress timber and absorption into the RAF had taken place before any were delivered. Although the Kangaroo was to have been used in the alternative role of night bomber, none were so employed and ten were delivered to No. 246 Squadron, RAF, at Seaton Carcw near the mouth of the River Tees, for oversea reconnaissance duties during 1918. Their working-up period was brief and between 1 May 1918 and the Armistice of 11 November, they flew 600 hr over the North Sea on convoy protection, sighted twelve U-boats, attacked eleven, sank one and damaged a further four. Two of these attacks were made by B9972 on 8 and 13 June 1918, respectively, but the only confirmed sinking resulted from prompt action by Lt E. F. Waring and his gunner Lt H. J. Smith while on patrol in B9983. At 15.25 hrs on 28 August 1918, they discovered the U.C.70 lying on the bottom in 14 fathoms close inshore near Runswick Bay where a near miss with the 520-lb bomb sufficiently damaged the submarine for it to be finished off with depth charges by HMS Ouse. B9983 did not survive the war, being destroyed in a serious crash at Seaton Carew. From an Admiralty report on the 1918 anti-submarine campaign it would appear that only seven or eight were airworthy at Seaton Carew at any one time, although ten were on charge in October 1918. At that time B9984 was at the Anti-Submarine Inshore Patrol Observers' School, Aldbrough, and three more at No. 2 (N) Marine Acceptance Depot, Brough, were probably never used operationally. In January 1919, when the Anti-Submarine School at Aldbrough became No. 1 Marine Observers' School, B9984 was joined by B9986 and B9987. Very surprisingly the report then goes on to say that '...notwithstanding the fact that all the twin-engined machines were fitted with Rolls-Royce engines, the number of their patrols curtailed by engine trouble compares unfavourably with that of other types...' This suggests that Kangaroo utilization was by no means as high as had been expected and contrasts sharply with the experiences of the company's pilot who flew them all and never had engine trouble of any kind on Kangaroos throughout 1918 and 1919. After the Armistice, all available Kangaroos and spares were put up for sale by the Disposals Board and early in 1919 R. W. Kenworthy and Harry Goodyear were sent off to Seaton Carew to pick out the best. They were subsequently ferried to Brough, Blackburns having purchased them en bloc in a transaction completed on 10 May 1919. There was some competition for the Kangaroos at Seaton Carew as Lt Valdemar Rendle was there looking for a machine with which to compete for the Australian Government's ?10,000 prize. He eventually selected the prototype machine B9970 and flew it to Brough for modifications, while three others, B9981, B9982 and B9985, were acquired by the Grahame-White Aviation Co Ltd and flown to Hendon on 11 May 1919, to be used as joyriding aircraft. For this purpose they were stripped of gun mountings and other military equipment and fitted with plywood floors aft of the wings. Fabric on top of the rear fuselage was then opened up to form two large cockpits accommodating seven passengers, an eighth being carried in the extreme nose. They retained their drab green camouflage and military serial numbers, and it was not until 8 June 1919 that they were allotted civil registrations G-EADE, 'DF and 'DG respectively. By that time B9982 'DF had already been wrecked when a wing struck the ground after the port engine cut when the machine was taking off from Hendon with a load of joyride passengers on Saturday, 31 May, during the official reception to H. G. Hawker and Cdr Mackenzie Grieve, pilots of the unlucky Atlantic Sopwith, and Cdr Read of the successful American transatlantic flying-boat NC-4. No one was hurt in this Kangaroo accident nor in a later one when the first of the three was damaged beyond repair in July of that year. The third Kangaroo survived to be repainted with 'Grahame-White Air Service' in white outline letters along the length of the fuselage and took part in Hendon's week-end racing, dropped parachutists, gave foreign missions their baptisms of the air and carried hundreds of joyriders during the two year currency of its C. of A. By 28 September 1919, when it was pressed into service to carry passengers and mail from the London terminal aerodrome at Hounslow Heath to Roundhay Park, during the rail strike, it had been painted up in full civil marks as G-EADG. From 1 October, it was commandeered by the Government to fly the mail to Newcastle via Leeds, and left Hounslow at 7.50 am with about 50 letters weighing a total of 3 lb 8 oz! Needless to say the service was promptly suspended when 'DG returned south next day. 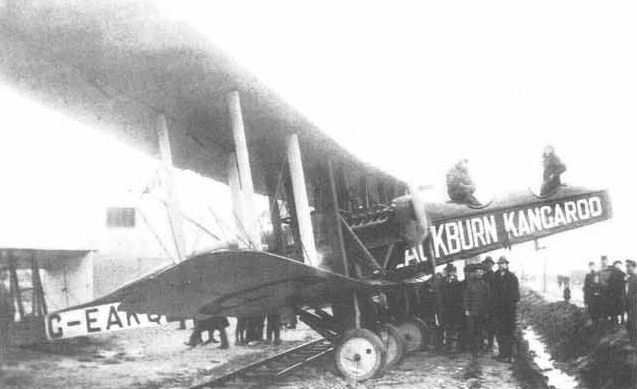 On 23 April 1919, Blackburns formed an operating subsidiary known as the North Sea Aerial Navigation Co to run commercial services, and their first recorded movement took place on 10 May 1919, when Kenworthy flew a load of freight from Gosport to Leeds. The first leg to Hounslow took 40 min and the remainder of the journey to Roundhay Park 1 hr45min. This machine, almost certainly B9978, later civil-registered G-EAIT, was quickly fitted with a large glazed cabin seating seven passengers. Glass sides were also fitted to the gun pit in the nose to accommodate an eighth. With this machine Kenworthy inaugurated a short-lived West Hartlepool-Brough service with three passengers on 26 May. Two other North Sea Kangaroos B9972 and B9973, later G-EAKQ and 'IU respectively, were similarly modified but differed in detail. G-EAIU had the glazed nose compartment and a large open cockpit in the rear for freight carrying or joyriding in the manner of the Grahame-White machines, and while still in military marks gave pleasure flights at Roundhay Park, during the victory celebrations in the same month. G-EAKQ had the same type of cabin roof as ' IT, but the nose was reshaped to form two standard pilot's cockpits in tandem and almost certainly had dual controls. The First Air Traffic Exhibition - ELTA - held at Amsterdam in August 1919, attracted exhibits from all the leading European aircraft manufacturers, and the stand of the Blackburn Aeroplane and Motor Co Ltd displayed large detailed models of the cabin-type commercial Kangaroo in both land and seaplane configurations. Some 20 years later, in March 1939, the model of the unbuilt seaplane project was presented by the company to the Hull Municipal Museum. On 8 August 1919, R. W. Kenworthy left Leeds for the Exhibition with five passengers in G-EAIT, cleared Customs at Hounslow and made Brussels as darkness fell. After inspection next morning by the King and Queen of the Belgians, the remaining distance to Amsterdam was covered in 1 hr 35 min. Tremendous Dutch enthusiasm kept the machine hard at joyriding for six weeks, except for a five-day delay caused by the destructive effect of the aerodrome's sandy surface on the airscrew coverings. G-EAIT also took second prize in a starting, climbing and short-landing competition. 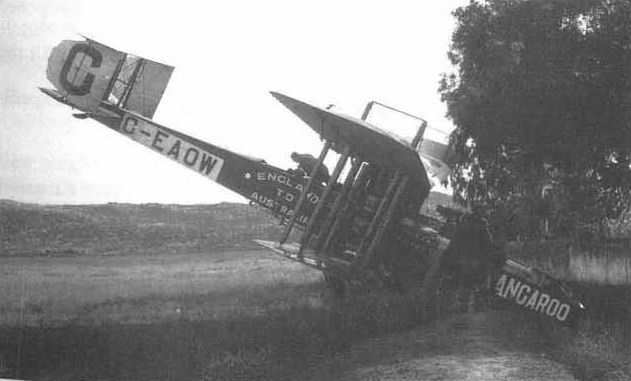 Joyriding profits were so satisfactory that the company thought it worthwhile to despatch a second Kangaroo, G-EAIU, which Capt S. J. Woolley flew out via Hounslow and Lympne on 28 August. Next day the exhibition organizers presented him with a gold watch when 'IU came last in the Circuit of Holland Race for commercial aircraft! With only a week to go before ELTA closed, Kenworthy and Woolley were joined by Maj Veale in G-EAKQ, and at the final count they had carried between them 1,400 fare-paying passengers and given many free rides without incident. All three Kangaroos then returned to Brough, and on the way home Kenworthy flew ' IT from Amsterdam to Lympne in 3 hr and from Hounslow to Brough in 2 hr, total fuel consumption working out at 25 gallons per hour. On 30 September 1919, and coincident with the activities of the Grahame-White Kangaroo during the rail strike, the North Sea Aerial Navigation Co Ltd commenced a regular service between Leeds and Hounslow. They used the cabin machines G-EAIT and 'KQ, despatching the southbound machine from Leeds at 10 am and the northbound from Hounslow at noon. The fare was 15 guineas single or ?30 return. Kenworthy flew the first southbound service with only one passenger (the company's secretary travelling free!) 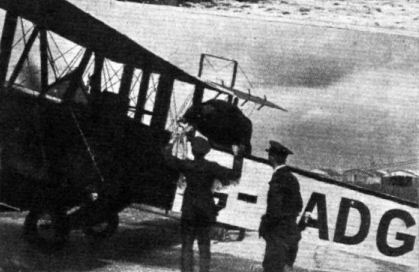 but on arrival at Hounslow he and the aircraft were commandeered by the Government to fly the strike-bound mail to Glasgow next morning at dawn. After some haggling with the GPO officer concerned, a price of ?945 was agreed for the round trip, worked out on the basis of 13 1/2 hr flying at ?70 per hour. The mail load was similar to that carried to Newcastle by the Grahame-White Kangaroo, so on reaching Glasgow Kenworthy promptly sold the seven vacant seats at ?20 per head for the return trip to Hounslow. The North Sea Aerial Navigation Co Ltd also acquired a pair of Avro 504Ks, G-EAGV and 'GW, which were converted to three-seaters to be used for joyriding and a short-lived Harrogate-Brough (Hull)-Scarborough service. The Kangaroos were maintained at Brough and went on service at the old Leeds aerodrome at Roundhay Park, a comparatively small field which was eventually abandoned as unsuitable. Brough then became the terminal, the service was extended to Amsterdam and the company re-formed as the North Sea Aerial and General Transport Co Ltd. The first 'service' was, in fact, a charter flight for Heatons (Leeds) Ltd to beat a dock strike in the Netherlands, flown by R. W. Kenworthy in G-EAKQ with Mr T. Bancroft as engineer. The Kangaroo left Brough at 12.30 pm on 5 March 1920 and landed at Lympne at 5 pm, arriving in Amsterdam at 10.30 am next day. The load, consisting of over 1,000 lb of ladies' raincoats and garments in West Riding cloth, was rushed through Dutch Customs and away by lorry, but strikers became hostile and Kenworthy had to take the machine over to Soesterberg Aerodrome for military protection before it could take off on the return flight on 13 March. The inbound load consisted of 1,200 lb of German aniline dyes for the Bradford Dyers' Association, each-way aircraft operating costs being approximately ?150. The service ran weekly for a time and carried 2 1/2 tons of freight a month initially, but the long detour to the Customs aerodromes in the south was a severe handicap and financially the scheme was a failure. Thus, after some 20,000 miles had been flown, 18,000 lb of goods and 1,200 passengers carried, this gallant pioneer attempt at air-freighting was abandoned. Kangaroos G-EAIT and TU were retained by the company for training purposes, as related later, but 'KQ, at that time the only one fitted with two pilots' cockpits in tandem, was sold in July 1921 to the Peruvian Centro Militar or Army Flying Service. Along with twelve Avro 504Ks, it was based at Las Palmas air station, 9 miles from Lima, and was still there in 1923. One of the four aircraft competing for the prize of ?10,000, offered by the Australian Government for the first flight from England to Australia by a British-built aircraft manned by an Australian crew, was Kangaroo G-EAOVX', which at the beginning of the previous year had been the performance trials machine B9970. When the Blackburn company submitted its entry on 26 May 1919, the crew was to have been Lt Valdemar Rendle, Charles Kingsford Smith and Cyril Maddocks, but the FAI would not permit the last two to fly. 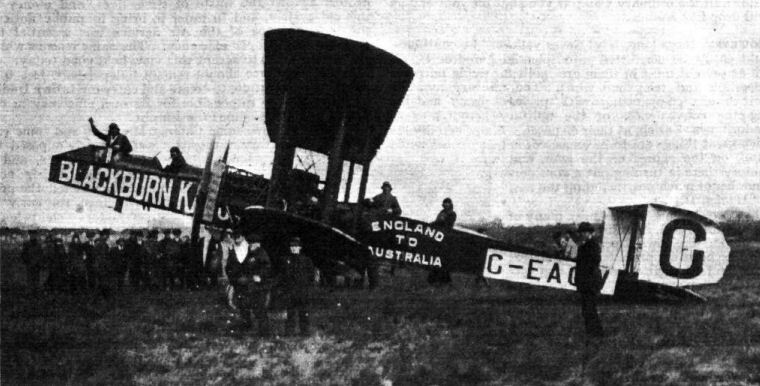 Thus when the Kangaroo took off from Hounslow at 10.37 am on 21 November 1919 - nine days after the departure of Ross and Keith Smith in the victorious Vickers Vimy G-EAOU - it was flown by Rendle with Lt D. R. Williams as co-pilot, explorer Capt (later Sir) Hubert Wilkins, MC, as navigator and commanding officer, and Lt G. H. Potts as engineer. Its Falcon II engines were expertly tuned by Rolls-Royce, fitted with special carburettors and provided with enlarged radiators for tropical flying. A large auxiliary gravity tank was mounted on top of the upper centre section and a duplicated set of flying and engine controls was fitted in the front cockpit. By the time it reached Suda Bay, in Crete, the magnetos had twice been tampered with and a further instance of suspected sabotage ended the flight three days later. When 80 miles out from Crete on 8 December, the pipe from the scavenge pump to the oil tank on the port engine (Rolls-Royce Falcon II No. 59) fractured, apparently as a result of fatigue caused by bending it backwards and forwards. Lt Rendle managed to fly back to Crete on one engine and made a difficult downwind landing, but the aircraft ran over a small ditch, punctured a tyre, slewed round, ran up an embankment and tipped slowly on its nose. No-one was hurt and the machine was undamaged, but cables to England for a spare engine were so distorted in transit that no engine was ever sent and the machine still lay at Suda Bay in July 1921. When a second ?10,000 prize was put up, this time by the Daily Express for a flight to India and back, the Blackburn Aeroplane and Motor Co Ltd were quick to enter Kangaroo B9977, civil-registered G-EAMJ and crewed by R. W. Kenworthy as pilot and Capt Hubert Wilkins, MC, as navigator. 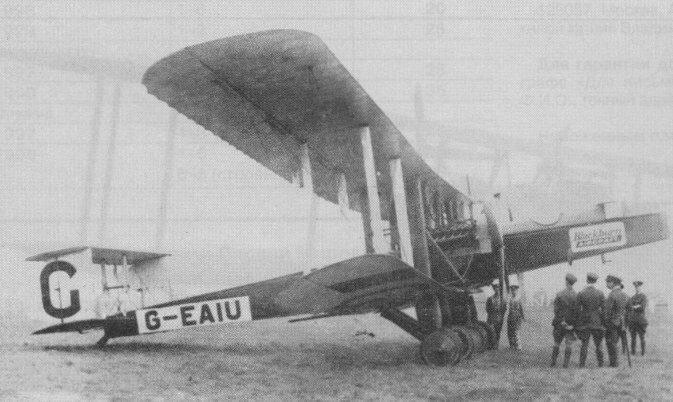 Operating expenses for the flight were guaranteed by the Yorkshire Evening News, and the aircraft was fitted out as a three-seater with a cabin of the type first devised for G-EAIT. This housed the overload fuel tanks, a comprehensive selection of spares and the compulsory commercial load, in this case a ton of crated whisky donated by a Scottish distillery. Oversize tyres were fitted to improve handling on sandy aerodrome surfaces, and Rolls-Royce carefully tuned the Falcon III engines and fitted large tropical radiators of the type used on G-EAOW. Only one other entry materialized, the Handley Page O/400 G-EASO Old Carthusian II to be flown by Maj A. S. MacLaren, but the flight never took place. On 11 May 1920, the Air Ministry postponed the start indefinitely on receipt of a telegram from the AOC, RAF Middle East, prohibiting flights east of Cairo because of strained relations with the Arabs. A Kangaroo was to have accompanied the British Aerial Antarctic Expedition later that year, but this scheme too was abandoned. Probably the most memorable day in the history of the Blackburn Kangaroo was 8 September 1922, when the cabin machine G-EAMJ intended for the India flight (modified to eight-seater) and the open-cockpit G-EAIU lined up at Croydon for the start of the first-ever King's Cup Race. Powered by Falcon IIIs specially tuned for the race by Rolls-Royce, they had both arrived at Croydon from Brough on the previous Tuesday, 5 September. G-EAMJ was entered by no less a person than the Rt Hon Winston S. Churchill, MP, and flown by Lt Col Spenser Grey, DSO, who had owned a Blackburn Mercury III back in 1911. G-EAIU, entered by Sir Walter de Frece, was flown by R. W. Kenworthy. Accompanied by Cdr Risk and some mechanics, Spenser Grey got away 10 min ahead of Kenworthy, but both aircraft made slow progress and eventually Spenser Grey's compass failed and he was compelled to land at Jarrow-on-Tyne to enquire the way. The two Kangaroos night-stopped at Town Moor, Newcastle, and pressed on over the mountains to Renfrew next morning, but without a compass Spenser Grey had no alternative but to follow Kenworthy and, after refuelling, they turned south for Manchester where both retired. The race was won by F. L. Barnard flying the famous D.H.4A G-EAMU and a few days later the four specially-tuned Falcons were removed from the Kangaroos and advertised for sale at ?485 each! After its attempt to operate commercial services failed in 1920, the North Sea Aerial and General Transport Co Ltd was kept in being with joyriding and exhibition flying until 1924, when an RAF Reserve School was established at Brough under its management. To provide refresher courses in twin-engined flying for serving RAF pilots and for Reservists, the surviving Kangaroos were fitted with dual control in tandem cockpits. In the training role they appeared in silver dope for the first time and, following the loss of the veteran G-EAIT in a crash at Brough on 5 May 1925 in which a pilot named Macdonald was killed, three more old Kangaroos were taken out of storage and modified to the standard of G-EAIT. They were fitted with Falcon II engines, for at that time all available stocks of Falcon IIIs were earmarked for Bristol Fighters. The names of the famous Daily Mirror cartoon characters Pip, Squeak and Wilfred, were painted across their flat noses and, with registrations G-EBOM, 'PK and 'MD respectively, they ended their days doing a useful, if unspectacular, training job and were a common sight in the Humber area until withdrawn from use in 1928. By March 1929 they had all been flown to Sherburn-in-Elmet and completely filled the hangars of the Yorkshire Aeroplane Club until taken out one at a time and broken up. All that now remains is an airscrew which has been cleaned and polished by the present Yorkshire Flying Club and fitted with a clock to serve as a mural decoration in their clubhouse at Leeds Bradford Airport, Yeadon. Until uncovered by a contractor's bulldozer in 1965, it had lain there under an immense pile of sand once used as ballast during test flights of Yeadon-built Avro Lancasters more than 20 years previously. Manufacturers: The Blackburn Aeroplane and Motor Co Ltd, Olympia Works, Roundhay Road, Leeds, and Brough Aerodrome, East Yorks. B9973 and B9977 were delivered to the RAF on 8 May and 18 June 1918 respectively; B9983 crashed at Seaton Carew while in service with No. 246 Squadron; one new and unidentified Kangaroo (vandals cut out the identity panels), crashed at Hornsea, East Yorks., while on delivery to Seaton Carew. G-EADE ex B9981. registered June 1919. C. of A. issued 21 June 1919. crashed at Hendon 29 June 1919. G-EADF ex B9982, registered 8 June 1919, no C. of A., crashed on take-off at Hendon 31 May 1919. G-EADG ex B9985, C. of A. issued 6 June 1919, registered 11 June 1919, C. of A. renewed 8 June 1920, withdrawn from use at C. of A. expiry 7 June 1921. G-EAIT ex B9978, cabin type registered 1 August 1919, C. of A. issued 11 August 1919, out of service from 11 August 1921 until C. of A. re-issued 2 March 1925 after conversion to dual trainer, crashed at Brough 5 May 1925. G-EAIU ex B9973, open type registered 1 August 1919, C. of A. issued 1 September 1919, out of service from 12 September 1923 until C. of A. re-issued 18 May 1924 after conversion to the prototype dual trainer Bongo, withdrawn from use at C. of A. expiry 19 April 1929 and broken up at Sherburn-in-Elmet. G-EAKQ ex B9972, cabin type registered 18 August 1919, C. of A. issued 9 September 1919, renewed 5 September 1920, sold to the Peruvian Army Flying Service July 1921. G-EAMJ ex B9977, cabin type for India Flight registered 8 September 1919, no C. of A., King's Cup Race 1922, converted to dual trainer Felix the Cat in 1924, C. of A. issued 20 June 1924, withdrawn from use at C. of A. expiry 2 February 1929 and broken up at Sherburn-in-Elmet. G-EAOW ex B9970, registered to the Blackburn Aeroplane and Motor Co Ltd for Australia Flight 24 October 1919, C. of A. issued 17 November 1919, abandoned in Crete 8 December 1919. G-EBMD origin unknown, registered 13 August 1925 for conversion to dual trainer Wilfred to Works Order 8837, C. of A. issued 21 January 1926, withdrawn from use at C. of A. expiry 7 February 1929 and broken up at Sherburn-in-Elmet. G-EBOM origin unknown, registered 18 June 1926 for conversion to dual trainer Pip to Works Order 8839, C. of A. issued 13 July 1926, crashed at Brough due to engine failure 29 May 1928. Pilot F/O E. B. Fielden. G-EBPK origin unknown, registered 29 October 1926 for conversion to dual trainer Squeak to Works Order 8840, C. of A. issued 3 February 1927, withdrawn from use at C. of A. expiry 2 July 1929 and broken up at Sherburn-in-Elmet. 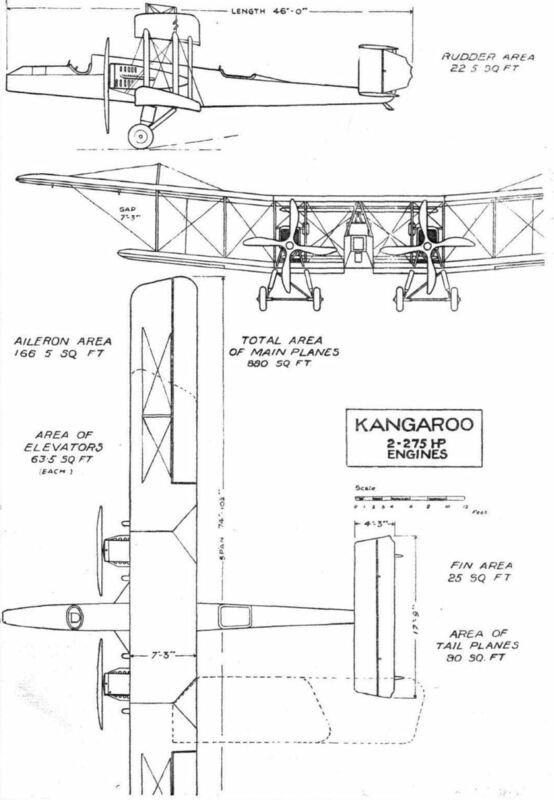 The Kangaroo was used by the R.A.F. from April 1918 as an anti-submarine patrol aircraft, operating from bases on the East Coast over the North Sea. In October 1918, fourteen Kangaroos were in service. In 1919 the Kangaroos were sold to civil operators and some were still flying as late as 1929. Two 250-h.p. Rolls-Royce Falcon engines. Loaded weight, 8,017 lb. Max. speed, 98 m.p.h. Service ceiling, 10,500 ft. Span, 74 ft. 10 in. Length, 44 ft. 2 in. 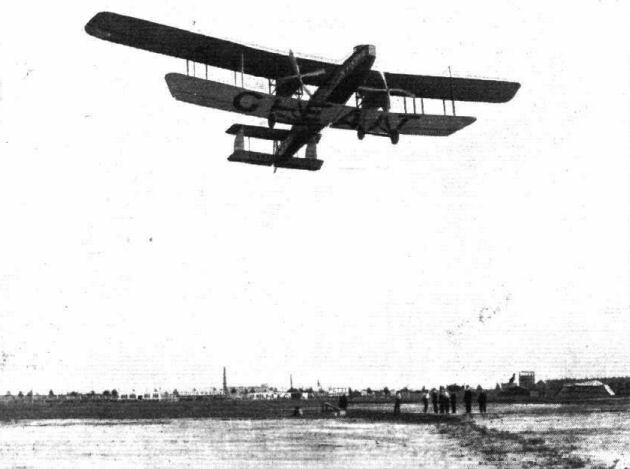 The Blackburn Kangaroo twin-engine maritime patrol bomber was a fairly urge, but attractively proportioned biplane, developed directly from the G P. seaplane (which had flown in 1916). 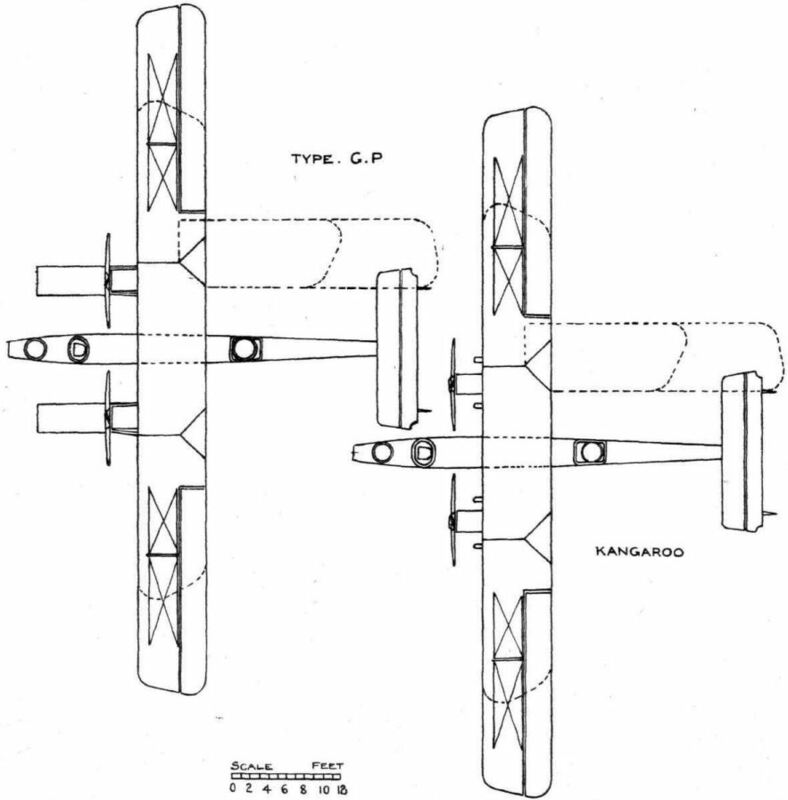 Indeed, the Kangaroo's design had begun as a twin-float seaplane powered by a pair of Rolls-Royce Falcons, and around an ability to carry a 1.100 lb torpedo, but this came to be changed when the Admiralty switched is preference to land-based patrol aircraft with long endurance when the German submarine activity intensified during 1917; there was probably more than a suggestion of influence in this preference as the Admiralty came to appreciate the value of the Handley Page O/100s in this role, prior to their transfer to the night bombing duties. As a result of this changed requirement (though the Blackburn aircraft was not conceived with any formal requirement in mind), the large pontoon floats were replaced by two pairs of mainwheels mounted beneath the engine nacelles. The latter, accommodating 250hp Rolls-Royce Falcon II twelve-cylinder, water-cooled engines with frontal radiators, were now raised above the lower wings. Rigged without stagger, the wings folded immediately outboard of the engines to give the aircraft a folded span of only 46 feet. Much of the G.P. 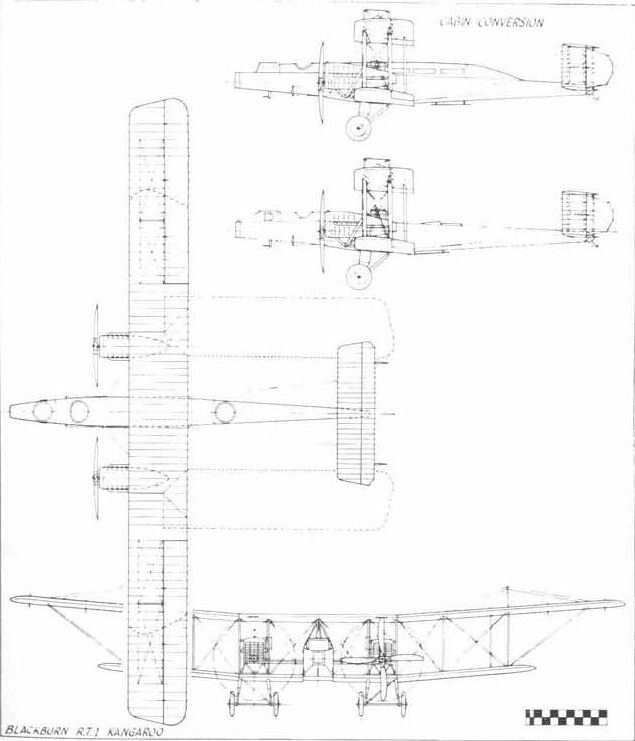 's primary structure was retained, although the curved fuselage decking aft of the wings was omitted, so that the fuselage possessed a rectangular and extremely slim cross-section. Unusually for an aircraft with such large upper wing overhang, ailerons were fitted to upper and lower wings, and interconnected by a single vertical faired rod. Another innovation, which was not tested, was the use of double-action ailerons which, by operating a handwheel on the pilot's control column, could be lowered to act as landing flaps, while retaining their differential roll control. The Kangaroo carried a crew of three, with pilot, nose and midships gunners - the nose gunner doubling as bomb aimer and being provided with an RNAS Mk IIA low-level bomb sight. As in the Avro Type 529, the midships gunner was inexplicably provided with limited dual controls, although in this instance these were confined to engine throttles and rudder bar, but with no engine switches nor control column! Twenty Kangaroos were ordered by the Admiralty as N1720-N1739, but before the first was flown by the American Clifford E Prodger, probably late in December 1917, these were changed to B9970-B9989. 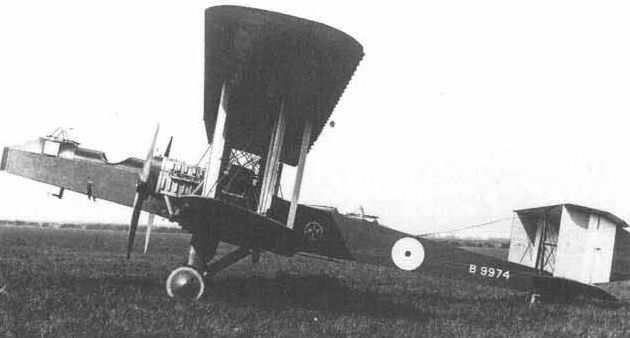 The prototype, B9970, was delivered to the AES, Martlesham Heath, on 3 January 1918, where it was flow n in competitive evaluation with the Avro Type 529A. The Kangaroo prototype was criticized as being very nose-heavy in the glide, while the rear fuselage lacked torsional rigidity tending to twist when recovering from a steep turn. The fuselage was now so slender that it was only with considerable discomfort that the nose gunner could operate his Lewis gun, and the midship gunner's field of fire was severely restricted by the large tail surfaces. It had been understood from the outset that about 50 Kangaroos would be required but, owing to an apparent misunderstanding, the number eventually authorized was no more than 20. This came about as the result of a belief in the War Office Technical Department that all the production aircraft then being worked on by Blackburn were identical to the prototype, and instructions were passed to the company to halt production when these aircraft had been completed. In fact almost all the criticisms were satisfactorily remedied on the first two or three aircraft following the prototype as was the prototype itself. The rear fuselage structure was considerably strengthened, and the front fuselage decking was built up to afford the front gunner better protection from the slipstream while manning his gun. The undercarriage of the prototype, comprising four pairs of plain V-struts without any shock-absorption, had collapsed during the AES trials; it was hurriedly re-designed to incorporate four faired oleo struts. Nevertheless the order for 20 Kangaroos remained unchanged, and these aircraft completed delivery to the RAF between April and September 1918, first joining No 246 Squadron at Seaton Carew, Durham, in May that year. Although the aircraft could have been flown as a night bomber without difficulty, being able to carry up to 1,000 lb of bombs, it was deemed more important to assume coastal anti-submarine duties. Carrying two RNAS 230 lb LC anti-submarine bombs externally with hydrostatic fuzes, the Kangaroo possessed an endurance of eight hours, or a total patrol range of about 560 miles. Alternatively, a standard 520 lb LC bomb, hydrostatically fuzed, could be carried vertically in an internal bay, and it was one of these bombs, dropped by Kangaroo B9983, flown by Lieut Edmund Francis Waring (later Air Cdre, CBE, DFC, AFC, RAF) that crippled a German submarine, UC.70, on 28 August 1918 near Whitby, enabling it to be sunk by depth charges. The Kangaroos continued to serve with No 246 Squadron until May 1919, by which time some were being transferred to No 1 Marine Observers' School at Aldbrough. Eight aircraft were subsequently sold to commercial buyers and given civil registrations; one (G-EAMJ, ex-B9977) was even entered by Winston Churchill in the first King's Cup Race of 1922. Several Kangaroos were converted as cabin aircraft for passenger flying, and others were provided with full dual controls for flying training. 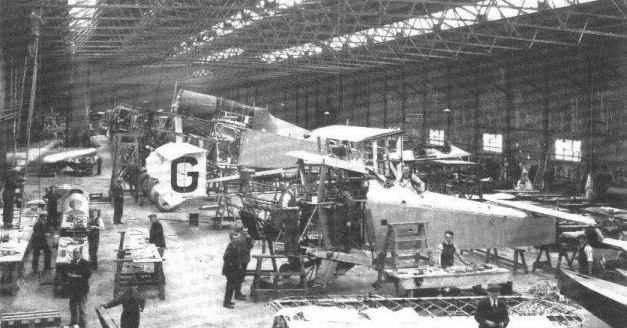 Three of these are believed to have been part-completed aircraft, B8837-B8839, whose production by Blackburn had been halted by the War Office during the winter of 1917-18, but were later completed as G-EBMD, G-EBOM and G-EBPK; known as Wilfred, Pip and Squeak respectively, they were flown as trainers during the 1920s. All were eventually broken up in 1929. Type: Twin-engine, three-crew, four-bay biplane anti-submarine patrol bomber. Manufacturer: The Blackburn Aeroplane and Motor Co Ltd, Olympia Works, Leeds, and Brough Aerodrome, East Yorks. Powerplant: Two 250hp Rolls-Royce Falcon II (later 270hp Falcon III) twelve-cylinder water-cooled in-line engines driving four-blade tractor propellers. Structure: Fabric- and ply-covered wire-braced wooden construction with forged metal joints and fittings. Dimensions: Span, 74ft 10 1/4in (wings folded, 46ft 1in); length, 44ft 2in; height, 16ft 10in; wing area, 868 sq ft. Weights: Tare, 5,284 lb; all-up (with 920 lb bomb load), 8,017 lb. Performance (with 460 lb bomb load): Max speed, 100 mph at sea level, 86 mph at 10,000ft; climb to 10,000ft, 38 min 10 sec; service ceiling, 10,500ft; endurance, 8 hr. Armament: Provision for single 0.303in Lewis machine guns with Scarff rings on nose and midships gunners' cockpits. Bomb load of up to four 230 lb bombs carried internally, suspended vertically, nose-up; alternative lighter load carried externally. A single 520 lb LC AS bomb could be carried nose-up internally, although it was usual for anti-submarine bombs to be carried externally for release from low altitude. 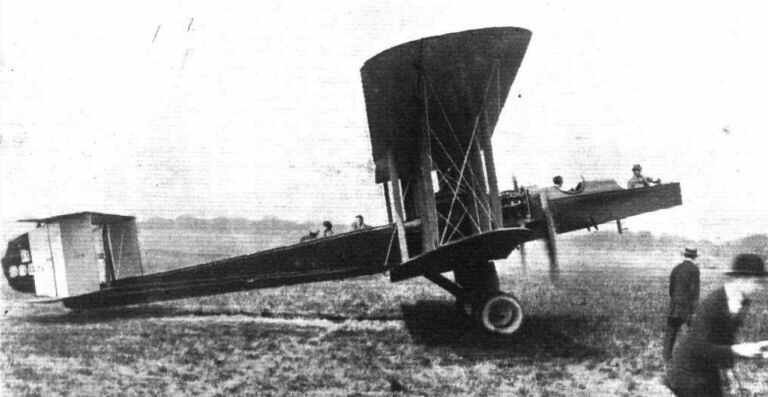 Prototype: One, B9970, first flown c.30 December 1917 by Clifford B Prodger at Brough, Yorks. Kangaroo. Built in I917as a land-plane development of the G.P. and S.P., the Kangaroo had Scarff ring-mountings in the nose and dorsal positions and was at one time intended to have a prone position also. This was to be arranged below the fuselage in conjunction with an extended tail skid. There was also a scheme involving what Blackburn termed an 'open-ended casing', housing a gun at each end. This was dated October 1917. 'Military load' of the Kangaroo was quoted by the makers as 1.220 lb., but this was inclusive of guns and fittings, and another Blackburn document gave the bomb load as 1.040 lb (equivalent to two 520-lb bombs). The recorded four 230-lb or one 520-lb internal loads (bombs vertical, noses up) were probably not usable in addition to external carriers. A photograph shows a Kangaroo with two 230-lb flat-nosed anti-submarine bombs side by side under the lower longerons. The bombs were sighted from the nose (RNAS Mk.IIA Low Altitude sight). A 520-lb bomb was dropped to good effect on at least one occasion, falling very close to a submarine, which was despatched by depth-charges from HMS Ouse. The Kangaroo's crew numbered three: the front gunner acted as bomb-aimer/observer and the tear gunner as wireless operator. The first machine had, in the first instance, a low-set forward gun-ring as on the S.P. and G.P., but on production aircraft the ring was carried high above the top longerons, on a higher level even than the pilot's cockpit. The field of fire was thus broadened. The rear mounting was protected in some degree by building up the coaming ahead of it, and additionally there was a windscreen for the gunner. 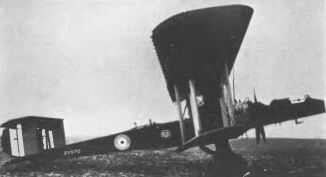 Fields of lire benefited from the very narrow cross-section of the fuselage, but there was official criticism that the gunner was prevented from firing astern by the 'box' tail. The official general-arrangement drawing shows Lewis guns with 'land-service' cooling jackets and with "single" (47-round) drums. One Blackburn document mentioned twin guns. The Blackburn Aeroplane and Motor Co., of Leeds, have no space on their stand for exhibiting complete machines. Instead, they are showing three very good scale models. One is of a Blackburn "Kangaroo" (commercial type), with its fuselage made deeper in the centre to form a cabin for the passengers. 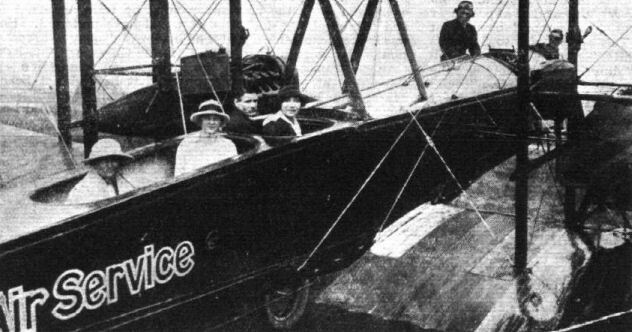 The second model is of a "Kangaroo" type of machine fitted with floats instead of wheels, while the third is a model of a flying boat. On the aerodrome there is now a "Kangaroo" which on Friday and Saturday, August 8 and 9, was flown over from Leeds to Amsterdam by Mr. Kenworthy, who will be remembered as a pre-War pilot at the Beatty School of Flying at Hendon, accompanied by five passengers. The machine left Leeds on Friday, and flew to Hounslow, where the usual formalities were attended to. It then left for Amsterdam via Belgium, but was overtaken by darkness and had to land at Brussels, where it arrived at 8.30 p.m. The news of its landing quickly spread, and next morning King Albert of Belgium came out to inspect it. 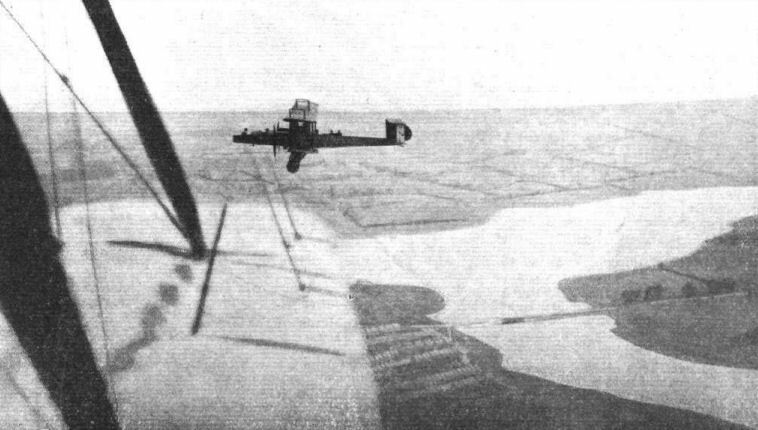 After giving an exhibition flight over Brussels, the "Kangaroo" left for Amsterdam covering the distance between the two cities in 1 hour 35 minutes. A safe landing was made at Amsterdam in spite of the somewhat soft ground, and Mr. Kenworthy succeeded in bringing the machine to her hangar without sinking in, the modus operandi being to taxi very fast right up to the tent, thus keeping a fair amount of the weight on the wings and but little on the wheels. IN our last issue we published scale drawings and brief descriptions of the machines entered by Messrs. Vickers, Ltd., and by Messrs. Martinsyde, Ltd., for the flight to Australia. Also a brief description of the Alliance machine. 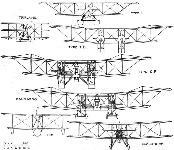 Scale drawings and a description of the Sopwith machine were published in our issue of October 16, 1919. This week we are able to complete the list by giving particulars and scale drawings of the remaining machine - the Blackburn "Kangaroo." The only machine to start so far is the Sopwith "Wallaby," which left Hounslow on October 21. This machine had to descend at Cologne, from which town a start was made again on October 31. Since then no news has been received from Capt. Matthews, but it is thought that he is weatherbound somewhere, far from any telegraph office, and no anxiety is felt for his safety. Of the five machines entered for this flight three are of the single-engined tractor biplane type, while the other two are twin-engined machines. Whether or not any of the machines succeed in winning the ?10,000 prize offered by the Australian Government - the conditions for which stipulate that the flight must be completed inside a month - some very valuable data should result, and it will be interesting to see which type of machine aquits itself the better, the single-engine or the twin-engined type. Both have their champions, who are convinced of the superiority of their own class of machine. The "twin-engineites" consider that two engines tend to more reliability, since in the case of one breaking down it only means one-half of the power plant out of commission. The other faction contends that a twin-engined machine cannot fly satisfactorily on one engine only, and that therefore no such safeguard is provided by fitting two engines, whilethey claim greater efficiency for the single-engined type. Time will show which side is right, although there is such a great element of luck in a flight like this that failure on the part of one type and the success of another will not necessarily be conclusive proof of the superiority of one type over the other. 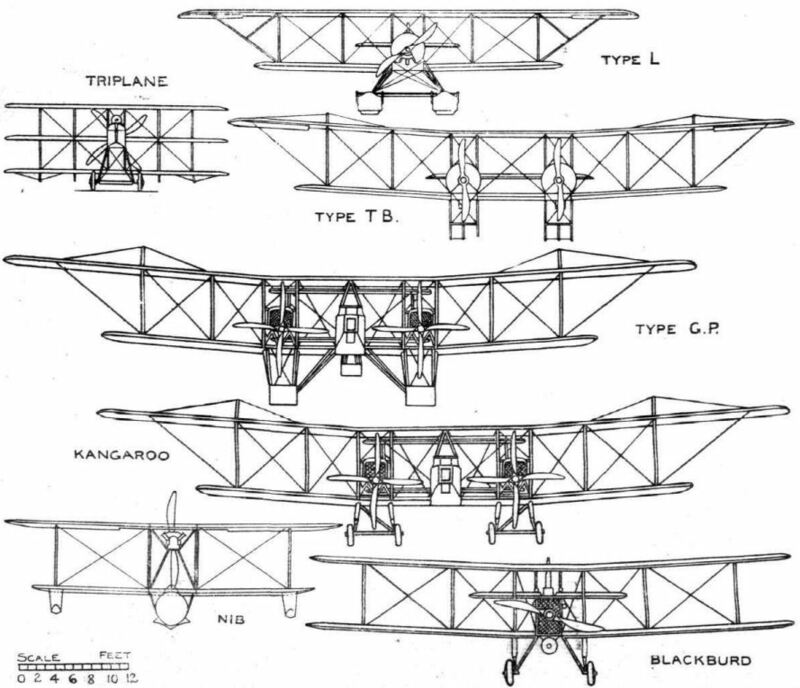 Except in a few minor respects the Blackburn "Kangaroo" entered for the Australia flight is similar to the standard machine of that name. The tankage has been increased so as to give the machine a greater range of flight. This has been made possible by the fact that whereas the standard machine (commercial) carries eight passengers with its normal complement of tanks, the Australian machine carries a crew of four. The petrol system has been redesigned for gravity feed so as to minimise the risk of engine trouble arising out of failure of the petrol system. The two 275 h.p. Rolls-Royce Falcon engines are mounted on the lower plane, each driving a four-bladed tractor airscrew. The large petrol tanks are mounted inside the main fuselage, in the space ordinarily occupied by the passengers in the cabin type of machine. The landing wheels are exceptionally well sprung by telescopic struts and rubber buffers, and the machine is expected to be able to alight safely on grounds none too suitable for the purpose. Certainly, at the E.L.T.A. aerodrome at Amsterdam, on the occasion of the recent aero show there, the Blackburn "Kangaroo" made light of the soft condition of the ground, which was such as to worry much lighter machines. Needless to say, a number of smaller spare parts are being carried on board, and the machine is not altogether unarmed, should natives show signs of hostility. No actual figures as to range, speed, etc., are available, but the passenger type of machine has a speed range of 97 to 51 m.p.h., a flight range, with normal tanks, of 580 miles, and carries a load of eight passengers or 1,540 lbs. By decreasing the number of passengers to four, and increasing the tank capacity, the flight range can, of course, be very materially increased. The route followed will probably be as follows, although should conditions demand this may be deviated from: Hounslow to Paris, Marseilles, Nice and Pisa to Rome. Thence to Cattania, Malta, Benghazi and Solium to Afcoukir. Ramleh, Bagdad, Basra, Bushire to Bandao-Abbas. Charbah, Karachi, Nasrabad, Allahabad to Calcutta. Rangoon, Don-Muang, Sengora, Penang, Kuala-Lumpur to Singapore. Bandoeng, Bima, Kupang to Port Darwin. Thence via Brisbane and Sydney to Melbourne. Petrol supplies are being arranged for by the Air Ministry and foreign Governments as far as Calcutta - thereafter the arrangements are in the hands of the Asiatic Petroleum Co.
Capt. Geo. H. Wilkins, M.C. and bar :- Commanding officer and navigator. Second in command of the Stefanson Arctic expedition, 1913-1917. Engaged with Historical Section, Australian War Records, as official photographer, A.I.F., France, Gallipoli and Palestine from 1917. War correspondent with Turks in Balkan War, 1912-13. Three years as Temp. Commander, Canadian Naval Service. Is under agreement as Chief of Scientific Staff of the Cope British Imperial Antarctic expedition, which will leave England about the middle of 1920. Has personal knowledge of practically every country in the world. Lieut. D. R. Williams :- Second pilot. Fourteen years' experience as automobile engineer in N.S.W. Instructor at the flying school at Richmond, N.S.W. Ferry pilot and instructor with A.F.C. Lieut. G. H. Potts :- Engineer officer. Son of the Principal, Hawkesbury Agricultural College, Richmond, N.S.W. Electrical engineer with the Australian General Electric Co., Sydney. Gunnery officer, A.F.C., served with No. 3 Squadron, A.F.C. in France. Lieut. Vol. Rendle :- First pilot. Son of Richard Rendler, F.R.C.S. (Eng. ), of Brisbane. Assistant electrical engineer with the Australian Meat Export Co., Balmain, Brisbane, Joined Queensland Volunteer Flying Corps, founded by T. Macleod in 1915. Came to England and enlisted (March, 1916) as air-mechanic, R.F.C. Commissioned to R.F.C. in 1917, and served in England and France as instructor test pilot and ferry pilot. 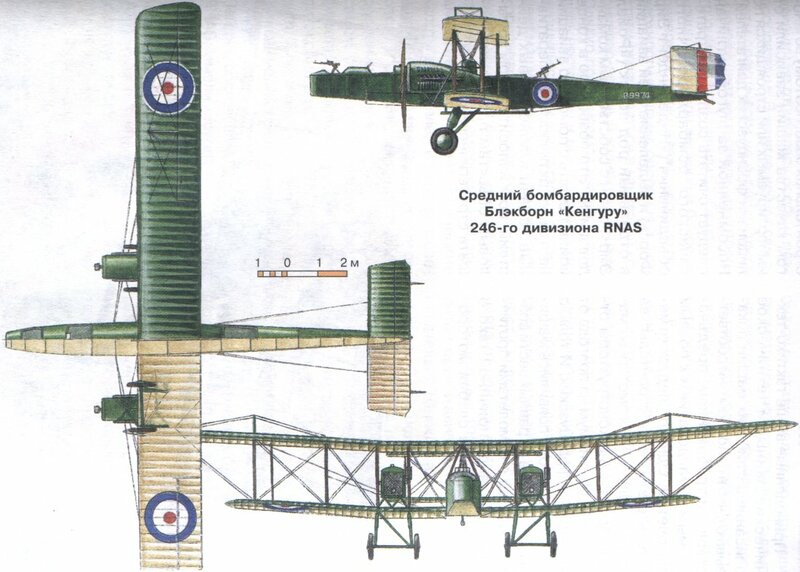 Blackburn RT.1 Kangaroo (B9974), 252 дивизион Королевских ВВС Великобритании, 1918г. 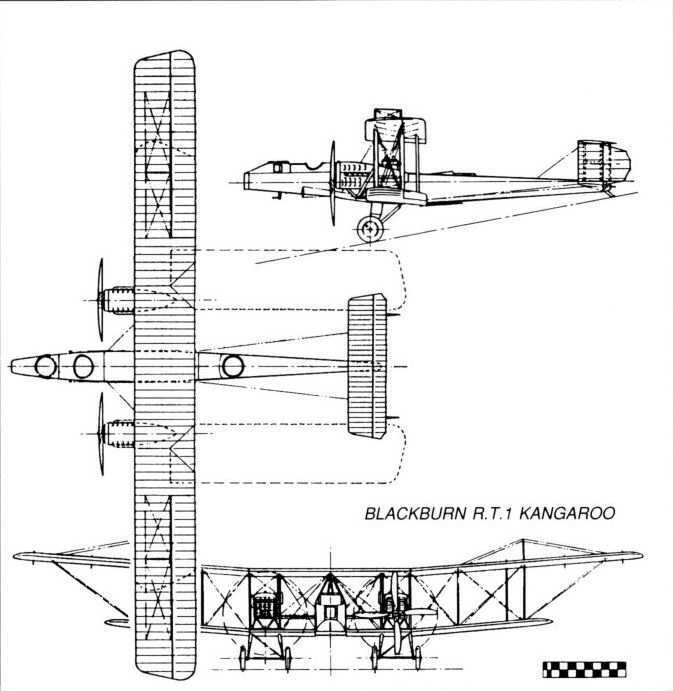 The prototype Blackburn Kangaroo, B9970, with slender nose profile and unsprung undercarriage struts. Note the enormous wing overhang. A HENDON PASSENGER CARRIER. - One of the Grahame-White Blackburn "Kangaroos." THE RAILWAY HOLD-UP AND MAILS BY AEROPLANE: Post Office officials and the despatch and receipt of mails at Hounslow. 2. The above Kangaroo from Grahame-White brought in mails from Leeds. Another Kangaroo of the North Sea Aviation Co. carried mails to Leeds. BRITISH MACHINES AT THE E.L.T.A. : 3. A Blackburn Kangaroo fitted with a cabin. R. W. Kenworthy taking off in the North Sea Aerial Navigation Company's first civil Kangaroo, G-EAIT, at the ELTA Exhibition, Amsterdam, in August 1919. Note full registration under both sides of tailplane. Послевоенная транспортно-пассажирская модификация "Кенгуру". 1923г.